First off, I'm a natural type and don't wear lipstick everyday; never anything too bright. I took it to the City-Cost Q&A to find out what to get for my work lipstick, rather than not wearing any. Majorica Majolica was recommended as the brand is a cheaper subsidiary of the Shiseido brand. I bought Pink 405, a tiny sheer stick for 800 yen plus tax at Don Quijote. I went a shade up from the lightest, which was super light and hardly visible on the back-of-the-hand color test. I thought, this is a real lipstick (although marketed to teens) so I might as well have a visible color. While wearing it, the color is not obvious, and because it's so sheer and light, it wears off fairly quickly. It feels fine at first but my lips feel really dry after an hour or two when it's already completely worn off. I usually apply my regular chapstick (Mentholatum medicated) before I put this on. I was disappointed when the Majorica Majolica lipstick melted the second it got humid and broke apart from the tube. It isn't connected inside the tube anymore but I still use it carefully. Maybe it needs to be kept in the fridge. It's also such a tiny amount. I don't think I'll buy this again because I like the more affordable tinted chapsticks better for everyday use. I also picked up Kate brand CC Mode Pink lip cream at 400 yen plus tax at Don Quijote. Goes on like a chapstick and feels moisturizing; sheer mild color compared with what's shown on the packaging. Like a grown up chapstick. It's also 8 SPF for minimal everyday coverage. As I'm an avid fan of the brand, I bought Metholatum Tone Up CC Rose Pink for 198 yen at Cosmos Drugstore. 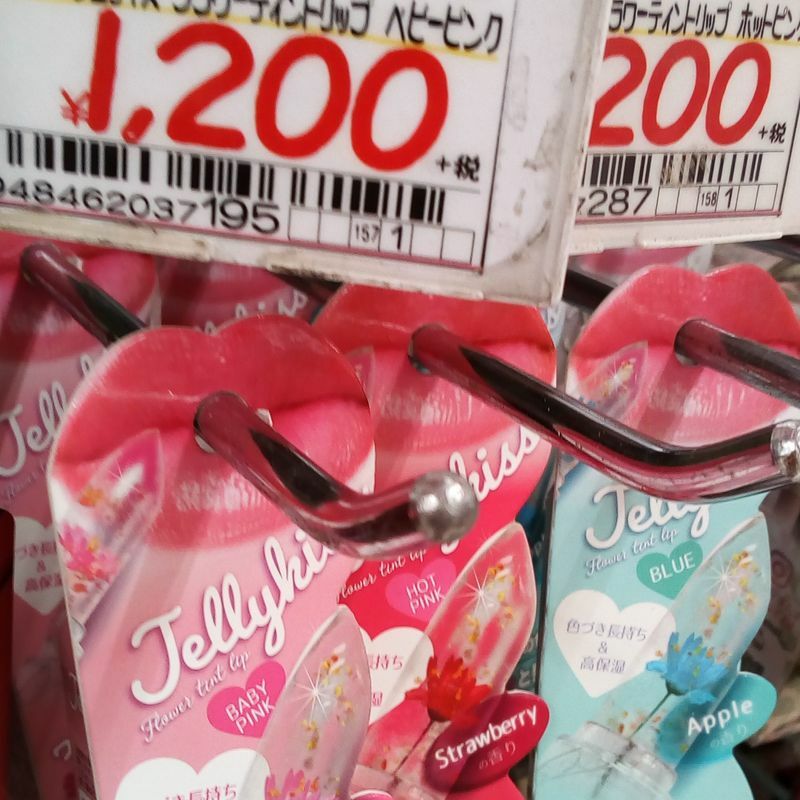 The other discount drugstore in town has it for closer to 150 yen. This brand is under 200 yen and has 20 SPF. Color is subtle but visible. I tend to layer this on top of my regular medicated chapstick, but the color is more obvious if I don't. This brand has several affordable and high quality lip glosses with an SPF, some waterproof for the rainy season or summer. This is the only one I've tried, but as I like this brand and they're the most affordable as well as the most moisturizing, I will probably stay with the Mentholatum brand. This one is especially good for the summer with the higher SPF. Those of you who normally wear make up might prefer a real lipstick, but I'm going for the inexpensive tinted chapsticks with sun protection. These clear lipsticks and Sailor Moon lipsticks were tempting as well! Have any of you tried them? I think they would make really fun souvenirs, at least.